…ok, not really, but I’m just having a free-for-all anyway. Here we go. 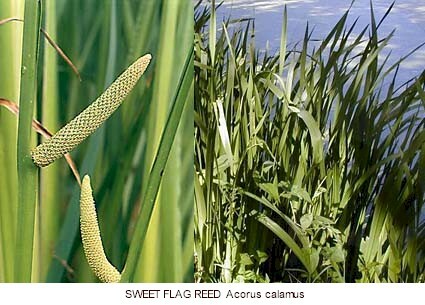 Acorus calamus, the reed plant of ancient Greece, was sacred to Dionysos (according to Theoi) because its rhizomes were used as an additive in wine, they don’t say what the rhizomes contributed to the wine. Also, the reed was a phallic symbol, and I have already mentioned elsewhere the importance of phallic imagery in ancient Greece and Rome in general and in the cult of Dionysos in particular. 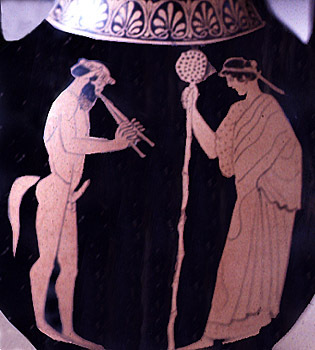 Also, the aulos is a reed wind instrument associated (especially by Plato) with Dionysos’ worship, particularly in his incarnation as the god of dithyrambs, which were wild, ecstatic songs presented in his honor by a male chorus moving in circular dance formation. I am reaching here, but I like stretching, it’s fun :-D. Yay for random associations! This entry was posted in Deity Information and tagged God Dionysos by Wandering Woman. Bookmark the permalink. I’ve been doing much the same with my name. Ashley is connected to the Ash tree which is associated with the ogham Nin, which is all about the “strength of women” and the weaver’s beam. Lots of good associations there that I really resonate with. Nice! The associations with your name are so appropriate!